The Learners Chorus was founded in 1979 by former members of the Hong Kong University Students’ Union Choir. Its repertoire includes a wide spectrum of choral works, and commissioned works by distinguished Hong Kong composers, including Dr. Chan Hing Yan, Dr. Victor Chan, Dr. Daniel Law, Mr. Law Wing Fai, Dr. Phoebus Lee, Mr. Michael Mak and Dr. Richard Tsang. Major choral works presented and performed in recent years include Bach’s Magnificat, Bernstein’s Chichester Psalms, Brahms’ Ein Deutsches Requiem, Gounod’s St. Cecilia Mass, Lully’s Te Deum, Mahler’s Symphony No.2 “Resurrection” and Symphony No. 8 “Symphony of a Thousand”, Martin’s Mass for Double Choir, Mendelssohn’s Lobgesang, Mozart’s Great Mass in C Minor and Requiem, Pärt’s Credo, Prauliņš’ Missa Rigensis, Poulenc’s Gloria, Rachmaninoff’s The Bells, Rossini’s Messa di Gloria and Stabat Mater, Rutter’s Mass of the Children, Stravinsky’s Symphony of Psalms, Tallis’ Spem in Alium and Verdi’s Messa da Requiem and Quattro pezzi sacri. Apart from hosting large-scale concerts with its official orchestral partner, The Learners Orchestra, the Chorus has also given guest performances both locally and abroad. 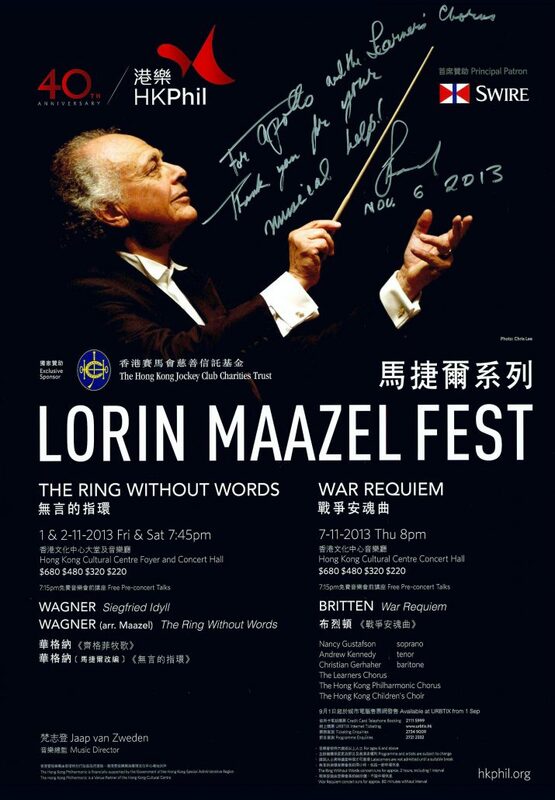 In 2013 and 2014, the Chorus performed Britten’s War Requiem with the Hong Kong Philharmonic Orchestra and its Chorus under the baton of the late Maestro Lorin Maazel, and to celebrate “Hong Kong Cultural Centre – Celebrating 25 Years” respectively. In 2015, Learners performed at “Macao Soul” with the Macao Orchestra and the Macao Perosi Choir at the 26th Macao Arts Festival. In July 2016, in collaboration with the Hong Kong Economic and Trade Office, London, Learners gave its London debut at St John’s Smith Square, performing a wide range of choral works in nine different languages, of different styles and from across different eras. In August 2016, alongside the Arnold Schoenberg Choir, the Vienna Boys’ Choir and the Hong Kong Treble Choir, Learners performed Mahler’s Symphony No. 8 “Symphony of a Thousand” at the Hong Kong-Vienna Music Festival. In May 2017, Learners performed at “紫荊花開”, a joint choral concert with the Shenzhen University Caisangzi Chorus (深圳大學采桑子合唱團), at the Shenzhen x Hong Kong Art & Culture Exchange Festival (深港青年文化交流藝術季). In 2018, Learners gave three visits to Macau to participate in the recording session of Te Deum by Macanese composer Fr. Áureo in May, and perform at “Heroes: A Video Game Symphony” and “National Geographic: Symphony for Our World” with the Macao Orchestra under the baton of Maestra Jessica Gethin, in June and November respectively. Learners is devoted to promoting music among young people. Students are often invited to sing with the Chorus or play in The Learners Orchestra alongside professional musicians. Young choir members interested in choral conducting have been offered the chance to conduct the Chorus in various concerts. Young musicians also give guest performances in its concerts. “Learners Learning” Concerts have been held to improve choir members’ vocal skills through ensemble or solo singing. During school breaks, Learners’ student members are often sponsored by friends of Learners to participate in vocal workshops and master classes given by its Music Director. Student Ticket Sponsorship Programme has served its mission of extending music appreciation opportunities among Hong Kong’s youth. Since 2006, almost 7,000 students, many first-timers, have received tickets to its concerts, all sponsored by benevolent friends of Learners. Active in community and charitable work, Learners has also given performances at elderly homes, disabled homes and sheltered workshops. Learners has also presented outreach programmes at community centres in London, featuring both choral singing and interactive games with the audience, both of which were positively received. Net ticket proceeds from fundraising concerts have been donated to charitable projects of the Hong Kong Christian Council, including the “Rebuilding Village Clinics Project”, “Water Cellars for Homes Project”, “Rebuilding Collapsing Schools Project”, “Senior High School Sponsorship Project”, “School Library Books Project” in China, “School Building Project in Myanmar” and “Village Development in Myanmar Project”. Learners has also raised funds for A Drop of Life Limited to install water cellars in Gansu, and participated in their “Walk for Water” project. The Chorus has also co-presented earthquake relief concerts in the past, including, most recently, “The Future of Nepal: Fundraising Concert for 4.25 Earthquake Victims” in May 2015. In June 2015, Learners performed at “Michaelmas Fair 2015 Concert – Hope and Dream”, a fundraising concert organized by St John’s Cathedral of Hong Kong.